Our popular Unlimited Golf & Free Lunch special is back for the 2019 golf season. This is ideal if you are looking to play more than 18-holes in a day. Gather up to eight of your golf cronies and save $34 to $39 per player to enjoy a special day of golf at Worthington Manor Golf Club. Offer Details: Offer is only available for purchase through our online store. Unlimited golf includes, cart with GPS, practice facility use before round and applicable taxes. Replay round can be made during check-in only on the day you are playing. Maximum of 8 rounds may be purchased per person. Lunch includes one menu item and iced tea, lemonade or fountain soda and does not include service gratuity. Unlimited golf & lunch special rounds are valid through October 31, 2019 excluding Holidays and days the golf course is closed for maintenance, outings or as the result of inclement weather. Purchases that have not been redeemed by October 31, 2019 (dollar amount balance) may be redeemable for regular rate golf rounds. Offer not valid on Holidays, weekends or with other offers, promotions, discounts or groups over 8 players. Worthington Manor Golf Club congratulates Tiger Woods on his incredible comeback in winning the 2019 Masters. Tiger uses the Bridgestone Tour B XS golf ball, feeling it fits his game to give him that winning edge. Now you can take part in that same fitting process to give your game the winning edge it needs. On Saturday, May 11, 2019 the Bridgestone Tour Trailer will roll onto the grounds of Worthington Manor so you may participate in a tour-like professional ball fitting. The Bridgestone Tour Fitting will feature trained, certified ball fitters, plus introduce you and your game to Tour Technician Randy Hughes, all in an effort to properly and professionally match you to the golf ball you should be playing. The Tour Trailer has been introduced by Bridgestone Golf to give all golfers the experience of what tour players experience at weekly tournament stops. The trailer promises to be an amazing show piece for the ball fitting process and the experts assigned to the fitting program will give golfers first rate service and knowledge in selecting a correct golf ball to play. The Bridgestone Ball Fitting is FREE and will be conducted at Worthington Manor between 8 am and 1pm. No appointment is necessary. 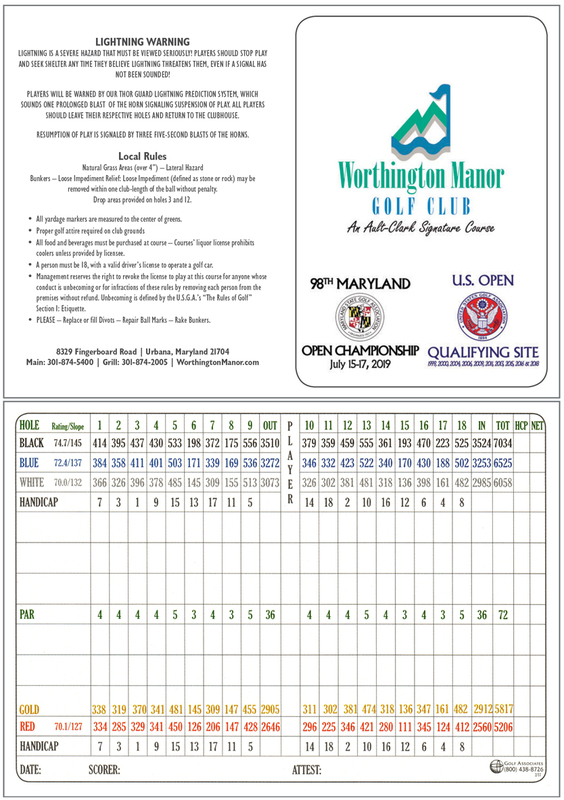 The Board of the Maryland State Golf Association has selected Worthington Manor Golf Club to host the 98th Maryland Open Championship July 15-17, 2019. Worthington Manor is honored to have been selected to host this prestigious event and is notably only the third public golf club to host this historic championship.